Today more than ever, food and beverage processors are under a bewildering array of operational pressures and safety regulations. Among those regulations is the Food Safety Modernization Act (FSMA), which is pushing sanitation up to the top of the priority list. Sanitation can impact your operations production and your profitability, and while food and beverage processors must comply with food safety regulations, they are still under incredible market pressure to operate efficiently and increase profits. 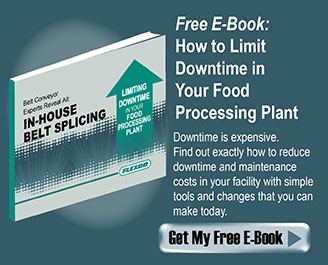 Despite these pressures, the focus of any food processing operation remains the same - hitting production goals while minimizing the risk of contamination. The consequences of cross-contamination can be devastating for your company, your customers, and your brand. But when sanitation is conducted properly, the result is not only a safe and quality product, but also increased production uptime. In a typical food production line, raw ingredients and processed products are transported along a belt conveyor system. This means that the conveyor belt system can be exposed to contamination, so food processors need to be fully alert about proper safety and sanitization procedures. The traditional plied method of cooling the splice and press involves water as the cooling agent. Since water has superb conductive characteristics and a high capacity to absorb temperature, it is a good option for bringing temperatures down. However, in food production applications, the threat of bacteria harbouring in water containers is a concern. Because of this, many operations prohibit water-cooled presses because the hoses and tanks could contain waterborne bacteria. Some operations require all equipment to be sanitized under close inspection at their facilities before allowing workers to enter. No matter which way you are splicing your belt, external belt crews tasked with the job of conducting belt splicing and maintenance can also pose a risk to cross-contamination and exposure to external contaminants. For example, the belt crew could be splicing a belt at a meat processing plant one morning, and then arrive at a bakery processing facility that afternoon. Even with stringent safety measures, contamination can occur due to the sharing of equipment, and even work boots and safety clothing. Using an outside belt crew to splice your belts usually means time spent washing down the belt and the entire conveyor system after the splice has been completed, which further increases downtime at your facility. The Food Safety Modernization Act (FSMA), has encouraged this focus toward food processing sanitation. Launched in 2011, the FSMA takes a more proactive approach toward food safety by adding safeguards to try and prevent contamination or problems from occurring within the nation’s food supply in the first place. So as companies scrutinize how to improve their food processing practices and stay ahead of the FSMA, eliminating the risks of contamination in their belt splicing processes is a great place to make positive changes to support sanitation and improve productivity. That’s a sound decision because the conveyor belt is in direct contact with food, especially on the processing side, and is, therefore, an extremely important part of the manufacturing process. Specially designed splicing tools are essential in food processing facilities to mitigate contamination risks. Using a fully integrated portable unit, which includes all essential systems for belt splicing into a single tool, eliminates the need for external equipment and therefore prevents potential cross-contamination that often comes from using a mixture of tools for belt maintenance. Additionally, using a forced-air cooled press offers the user convenience by not having to source and transport water to the conveyor, which also limits the chances of introducing bacteria to the belt. With a fully integrated belt splicing tool, you can also quickly and easily conduct your belt splicing in-house, which removes the risks associated with outside contractors coming into the facility. These factors combined have the potential to drastically limit downtime. As a manufacturer, your goal is to make the most of every minute, reduce downtime and maximize productivity. Sanitation is a critical and regular part of food and beverage manufacturing. By investing in the right tools for your belt splicing, you can take control of the sanitation process in your facility, ensure you have a safe product, are fully compliant with the Food and Drug Administration (FDA) and the United States Department of Agriculture (USDA) food safety laws, and reduce operation disruptions. A smart and sanitary belt splicing process can have a significant positive impact on your operation. When Is It Time to Use a Finger-Over-Finger Endless Splice?